We already wrote about the illusionist who can be added to Minecraft PE 1.2.0. So this new mob is able to create copies of itself, to blind you and shoot from the bow. Initially, the Illusionist was added to MC 1.12 and by tradition it will be moved to the pocket edition. You can learn more about it if you install this simple addon. Unfortunately, the illusionist can not create illusions and this is the only difference from the original being, but this mob completely copies appearance and behavior. You can find it in forest mansions and fight with it. More detailed article about the Illusioner - MCPE 1.2.0. 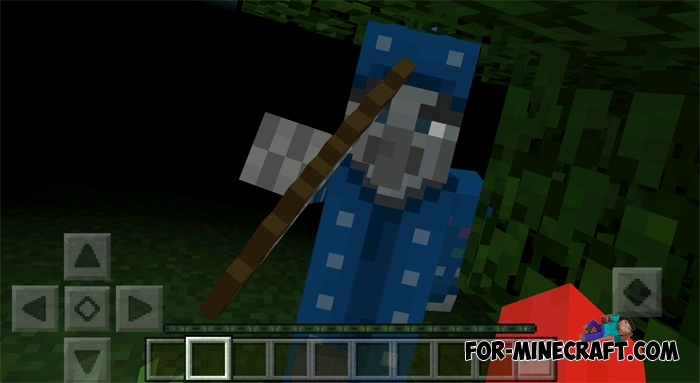 Minecraft PE 1.2.0 - Illusioner!We can say with confidence that two new mobs will be added in future versions, most likely to Minecraft PE 1.2.0 since the Pocket Edition is now almost a full copy..